NOW 650mg! 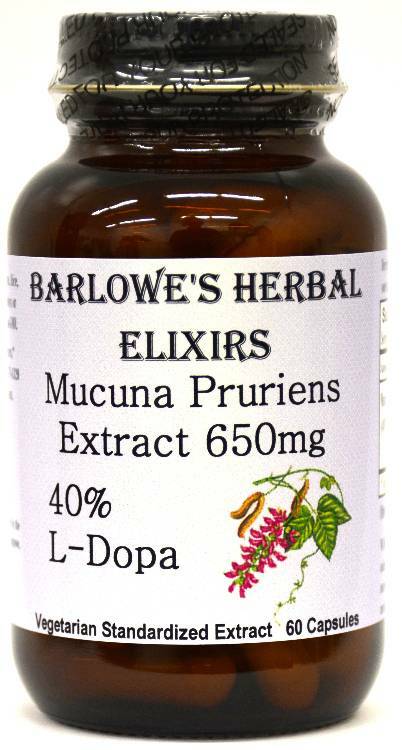 Barlowe's Herbal Elixirs now offers a 40% L-Dopa Mucuna Pruriens Extract. Mucuna Pruriens has been utilized for centuries in India. Bottled in Glass! No Stearates! No Fillers! No Junk! NOW 650mg! 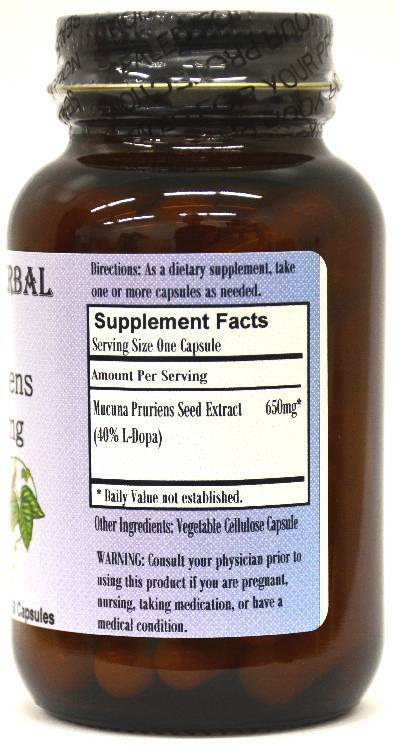 Barlowe's Herbal Elixirs now offers a 40% L-Dopa Mucuna Pruriens Extract. Mucuna Pruriens has been utilized for centuries in India. This and all of our products are STEARATE FREE! 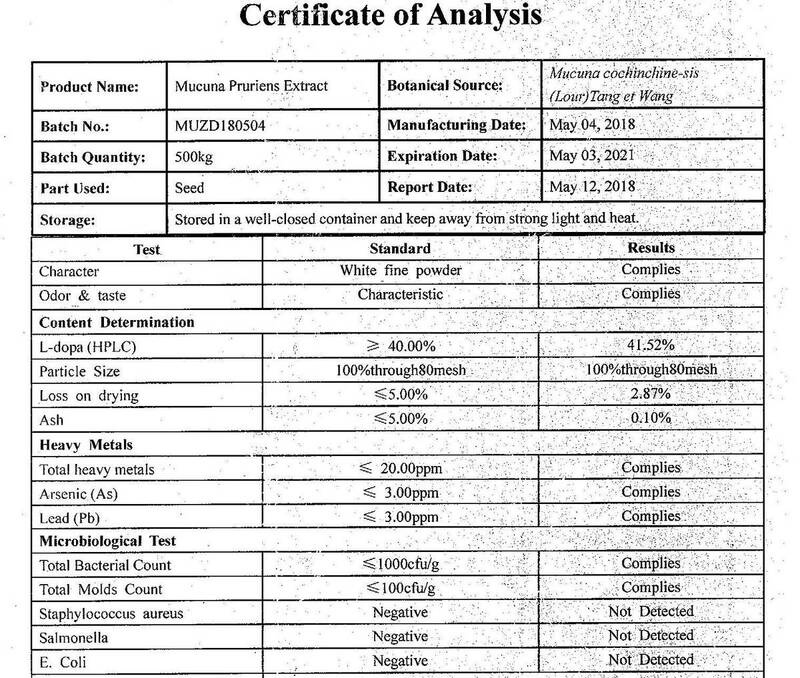 The Mucuna Certificate of Analysis (COA) of this particular batch is shown above. Bottled in Glass! No Stearates! No Fillers! No Junk! ***These vegetable-derived capsules (Vegan, Kosher and Halal certified) are filled on hand-operated equipment and only pure, unadulterated herbal extract is contained in the capsules. There are no magnesium stearates, fillers, gelatin, silicates, gluten, corn, wheat, rice, yeast, starch, titanium dioxide, artificial colors, artificial flavors or preservatives. Capsules produced with high speed equipment in herbal and dietary supplement "factories" generally contain several other ingredients, including powdered lubricants called STEARATES (which can greatly diminish an herb or supplement's absorption into the body). Check their labels! Barlowe also bottles his products in glass as he believes chemical vapors can vent from plastic containers and contaminate the contents and that glass is better for the environment. Directions For Use: As a dietary supplement, take one capsule twice daily on empty stomach. If any side effects occur, stop use immediately. Adult use only.